Enjoy South West London’s best Hot Dogs, Khanage Award Winning Curry and your regular favourites at the Market on The Piazza (opposite Morrisons and The Odeon) in Wimbledon Town Centre. At this weekend’s market, musician Emily Lee will be performing in The Piazza to entertain market shoppers and there will be a Mother’s Day theme with stalls selling jewellery, handmade scented candles and lanterns, and artisan handmade bathroom products. 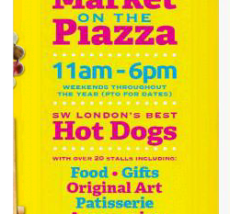 Over twenty stalls will descend on The Piazza during weekends throughout the year. At every market there will be something different with the best of our regulars selling delicious hot and cold foods, gifts, origional art, accessories, books, children’s toys, homeware and more. Browse our stalls, chill out in a deckchair, taste the food, and be entertained by visiting musicians that will bring The Piazza to life.